A fast slender snake with a fine tapering tail it can usually be found in drier habitats where it feeds chiefly on small vertebrates, especially lizards. 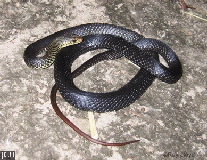 Larger specimens are venomous. The body is olive-brown to black above, sometimes flushed with red, and the scales have a dark edge. Belly is yellowish-grey to greenish-grey, the underside of the tail is reddish. There is no dark line across the snout. Previously known as Demansia atra.